Dutch mathematician; born at Amsterdam June 6, 1797; died at Delft Feb. 9, 1866. He sprang from a Portuguese Marano family which had gone to Holland in 1604. From his mother, a Da Costa, he acquired a complete knowledge of the south-European languages; and while yet a schoolboy he displayed remarkable talent for mathematics. Littwack and Van Swindern were his teachers, and at Brussels Quetelet, with whom he edited the "Correspondance Mathématique et Physique." In 1823 he published "Wiskundige Mengelingen." In 1828 he was appointed gager at Delft; afterward he became inspector-general of the gaging-office there; and in 1842 he was appointed teacher of higher mathematics in the same city. 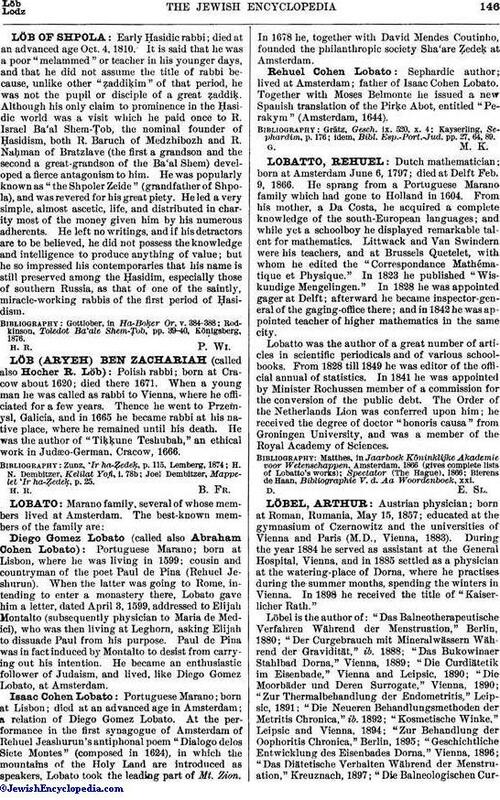 Lobatto was the author of a great number of articles in scientific periodicals and of various schoolbooks. From 1828 till 1849 he was editor of the official annual of statistics. In 1841 he was appointed by Minister Rochussen member of a commission for the conversion of the public debt. The Order of the Netherlands Lion was conferred upon him; he received the degree of doctor "honoris causa" from Groningen University, and was a member of the Royal Academy of Sciences. Bierens de Haan, Bibliographie V. d. Aa Woordenboek, xxi.